Cook the Swiss chard until tender; we microwaved it for about 5 minutes. You can also sauté it in a little olive oil or butter until tender. When it is cool enough to handle, drain it and squeeze out as much of the moisture as you can (wrap in paper towels and squeeze). Chop it until it’s pretty fine and set aside. Put the butter, onion and bacon in a small sauté pan over medium heat and cook until the bacon is cooked and the onion is golden. 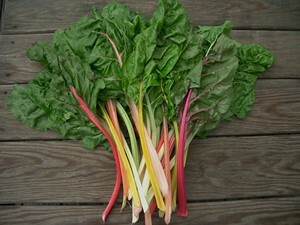 Add the chopped chard and about 1/2 teaspoon of salt and cook about 5 minutes, stirring occasionally. Put the mixture in a bowl and when it’s cooled to room temperature, add the ricotta and flour. Stir until well mixed. Add the egg yolks, grated Parmesan and nutmeg and stir until combined. Taste and add salt or nutmeg as needed. 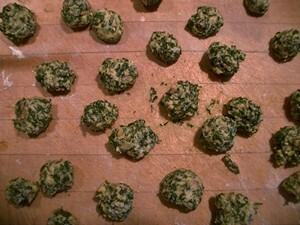 Make small balls of the mixture by rolling them in your hands. They should be about 1/2″ in diameter. If the mixture is too sticky, dust your hands lightly with flour. To cook the gnocchi, bring a large pot of salted water to a boil. 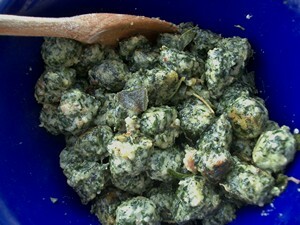 Add the gnocchi and cook for about 4-5 minutes. Drain the gnocchi in a colander, or remove them from the pot with a slotted spoon. To serve them, we made a simple sauce of butter and fresh sage. Melt a little more than half a stick of unsalted butter in a big sauté pan over medium heat. When the butter is melted, add about 20 fresh sage leaves. Let the sage leaves cook in the butter until fragrant, about 2-3 minutes. Gently add the gnocchi and toss to coat with the butter. Serve with additional Parmesan and enjoy! This is not really the traditional Nicoise way, which uses potatoes with the chard, however these gnocchi were light and flavorful and tasted delicious. You could also serve them with a traditional tomato sauce, or a tomato/cream sauce if you wanted something fancier. If you wanted to make it vegetarian you could leave out the bacon.